GM may be bankrupt but that hasn't stopped the ailing automaker from test-driving its Volt electric car ahead of schedule this week. Engineers took the plug-in electric hybrid for a brief spin around Chevrolet's Technical Centre campus in Warren, Michigan. On his blog, Chief Engineer Andrew Farah described the ride as 'exhilarating'. 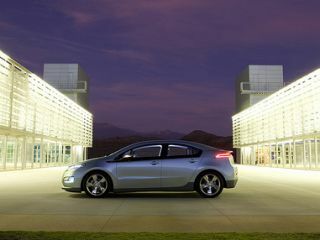 The Volt only uses its 4-cylinder petrol engine to power a 16kWh electric battery, which is expected to have a range of about 40 miles. GM will now ramp up the manufacture of pre-production vehicles. Farah says, "We're producing a few Volts per week now, but we'll quickly ramp up to 10 per week and will have approximately 80 pre-production vehicles built by October." "After driving the Volt yesterday, I'm increasingly confident we're on target to deliver," he added, referring to the Volt's expected retail launch sometime next year. GM missed on the latest auto industry bail-out this week, when Ford, Nissan and Tesla Motors were given access to nearly $8 billion in federal loans to develop new vehicles. Ford's $5.9 billion will go towards improving fuel efficiency in many of its existing models, Nissan will spends its $1.6 billion on building electric cars and batteries, while Tesla's $465 million loan will help bring its Volt competitor, the Model S sedan, to market.